Delegates at Spear’s annual ‘£1 Billion Meeting of Minds’ gathered in central London last month to hear an impressive line-up of speakers offer their perspectives on the factors shaping the world of high-net-worth clients. There were warnings but also ideas and optimism aplenty. Andrew Carrier, Dolfin’s CMO, reports. Her insights proved the perfect backdrop to a day-long discussion that spanned, politics, economics, citizenship and technology as speakers and delegates alike grappled with what ‘the future of wealth’ is likely to look like. If citizenship felt important to the audience as Robert Amsterdam took to the stage, it must have felt like the least of their worries by the time he concluded. In a impassioned, whirlwind tour of today’s geopolitical landscape, Amsterdam struck a solemn tone, warning the audience that HNWs are facing “the highest point of risk” for their individual investments. Amsterdam laid much of the blame for that risk at the feet of the US administration. “The US is leading the world in deinstitutionalisation,” he said. Echoing Flanders’ concerns, he suggested that “Trump’s policy of going it alone means we have thrown out the rules.” Offering the current US/China trade way as an example, Amsterdam suggested that the US doesn’t care about tariffs but, rather, is trying to change the terms of trade – and he thinks no one should bet against the administration succeeding. With the scene of increased regulation, unpredictable politics, combined with economic pressures firmly set, it was left to the Dolfin-sponsored panel on ‘how technology will help humans reimaging wealth management’ to take the audience to a brighter future. 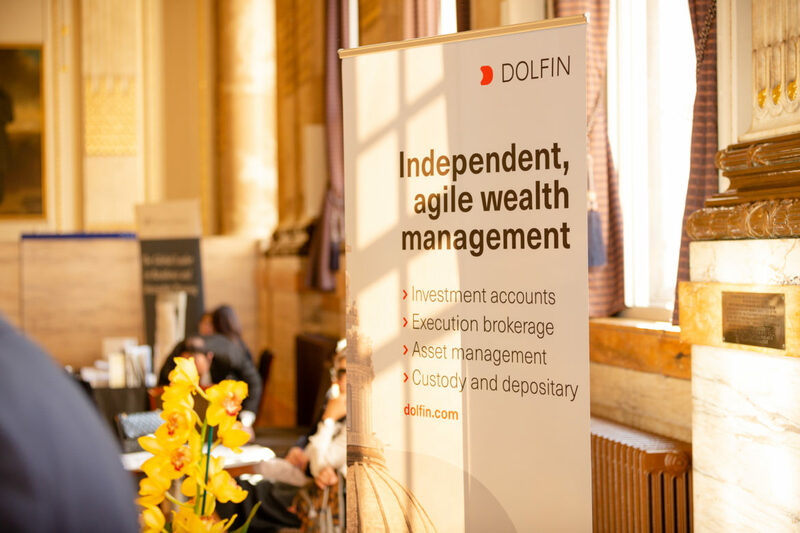 Introducing the session, Dolfin CEO Denis Nagy was unequivocal: “Technology will make processes within wealth management scalable while meeting the new expectations of clients”. To Georgios Ercan, Head of Sales at Dolfin, those expectations have in part been driven by new regulation and global tax reform. “Clients want efficiency, security, and reliability,” he said. All agreed that performance is critical. The solution offered by eToro Managing Director Iqbal Gandham was to change the very business model of wealth management. “We need to combine flat fee charging with a percentage of AUM,” he said. Faced with the daunting challenge of wrapping-up the day and drawing some conclusions, Spear’s editor Alec Marsh gathered a final panel consisting of Ian Barnard, founding partner of Capital Generation Partners, Victoria Leggett, a portfolio manager at UBP, Lord O’Neill of Gatley, vice chairman of the Northern Powerhouse Partnership and Dolfin CEO Denis Nagy. Brexit was the first ball Marsh bowled but his panel was keen to bat it away. “There are lots of things that attract people to the UK. Most of them won’t change after Brexit,” said Leggett. “At the Brexit referendum, we voted to be poorer. The only question now is how much,” offered Barnard. O’Neil segued like a consummate politician. “I don’t think Brexit is the biggest threat to the UK economy,” he said. For O’Neil, the main problems facing the UK are the 20 per cent in ‘lost’ productivity over the last decide, coinciding with profound generational inequality and regional inequality. The panel agreed that addressing inequality is increasingly on the minds of investors. “A lot more people are talking to me about fairness,” said Barnard “It’s generational.” He went on to talk about the rise of impact investment and ESG funds among millennial investors especially, saying that he could see a future where ‘100 per cent of investments are sustainable’. O’Neill agreed with Nagy. “Profit with purpose”, as he put it, has a fundamental part to play in the future of wealth.